ESPN produced a documentary called “The Badboys”. The story focused on the two year time frame of the Detroit Pistons and their dominance of the NBA. Over a 20 year period, the NBA had been classified as the Bird, Magic and Jordan eras. Magic Johnson’s Los Angeles Lakers and Bird’s Boston Celtics dominated the 1980’s by winning a combined eight NBA titles. Michael Jordan and the Chicago Bulls began their reign of terror in the NBA from 1991-1998. Chicago went on to win six titles in an eight year span. It is truly amazing how the 1989-1990 Detroit Pistons are mysteriously glossed over by most fans and media. The Pistons had a very bad reputation due to their physical style of play. People have a hard time realizing the talent Detroit possessed as a team. The team was lead by Chuck Daly, who was better known as “The Dapper Don” by media and his players. Daly preached teamwork, ball movement and a physical style of defense. Floor general duties were held by All-NBA guard Isiah Thomas. He was known a tough minded point guard who had championship level intangibles. Players such as Bill Laimbeer and Rick Mahorn were known as the team enforcers who often dished out punishment on opposing players. 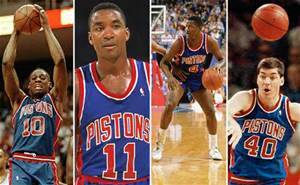 Low key players such as Joe Dumars, Vinnie Johnson, Adrian Dantley and Dennis Rodman were pivotal to the success of the Badboys. These four players did their damage in a quiet fashion as compared to Laimbeer, Mahorn and Thomas. In the 1988 NBA Finals, the Pistons pushed the World Champion Los Angeles Lakers to the brink. Many would say, if a controversial foul was not called against Bill Laimbeer in the closing seconds, the Pistons may have won game seven. The foul was called in favor of Kareem Abdul-Jabbar due to the Badboy mystique as quote on quote “dirty players”. The team’s leader Isiah Thomas had a performance of the ages in game six of the series. He severely twisted his ankle in the third quarter of play. Amazingly after the sprain he went on to score twenty-five points. Thomas valiantly finished with a game high forty-three points. The Badboys showed the heart of a champion even in defeat. The next season, Detroit made a change that ultimately allowed them to reach their full potential. The trade of Adrian Dantley for Mark Aguirre gave the Pistons another hard-nosed player who could score and provide better defense at the small forward position. Detroit finished the season by running through the Eastern Conference and setting up a Finals rematch with the Lakers. The Series would be very different this time around, as the Pistons completely dismantled Los Angeles four games to one. The Pistons went on to win back-to-back championships by beating the Portland Trailblazers four games to two. The road for the Badboys proved to be more competitive as compared to previous seasons. The Eastern Conference Final against the Chicago Bulls went all seven games. The series literally pushed Detroit to the limit. Surprisingly, the East Final series would prove to be tougher for Detroit than the Finals against Portland. In the very next season, the Chicago Bulls broke the cycle and beat Detroit in five games leading to their first title. It would be the end of the Badboys as the NBA knew them.